Why are Iranians so secular? At least the Iranians living in Europe and North America. My anecdotal experiences are that there are plenty of Iranians or people of Iranian origins in Sweden who openly reject Islam and are atheists. They tend also not to identify with Islamic Iran but with pre-Islamic Iran. Other immigrant groups from the MENA region is in my experience more religious, with Somalis and Afghans being the most religious, at least in my experience. However, data supports my anecdotal experiences. Below is a list of the religious affiliations of Iranian Americans (and here we must also remember that a significant amount will tick their people's traditional religion without much further thought). So how come this? Why are Iranians much more secular than other MENA groups? You could say that this is probably due to education, and that's probably true, but it then begs the question why Iranians are more educated. 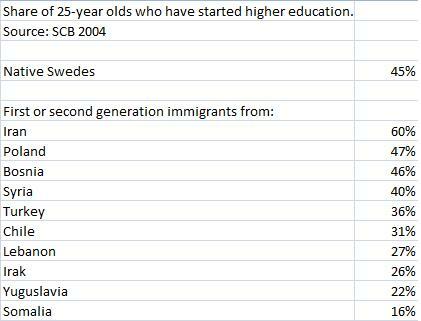 Higher education is free in Sweden, anyone can apply. Speaking of education, in the entire history of Islam Iran has produced many scholars. Is it because of this tradition that they are secular? Is it because they were not Arabized and retained much of their native culture (the language, for instance) which enabled them to separate them from the Arabs? From what I understand, the adoption of Shia Islam was a part of this, to distance themselves from the mostly Sunni Arabs. By contrast, many Arabs and other Islamic peoples reject the pre-Islamic part of their history as Jahiliyyah, the age of ignorance. Quite a tragedy and misguided IMO. Iranians on the other hand even in Iran celebrate traditional Iranian festivities, despite that the Islamic regime would prefer they didn't. I find this phenomenon rather interesting. Perhaps this could be a forerun into a secularization of the Islamic world as a whole, though I might be a little bit too optimistic here. Most Iranians I've known were academics. Some were religious, others not. Iran is a country with a long and complex history and like any nation , is neither ethnically nor culturally monobloc. It has been through several upheavals in the last 50 years. Expecting uniformity of Iranians is at least as silly as expecting it of Scots- and as the "implications of Scottish Independence" thread makes clear, so long as 100 Scots are able to agree on anything, there will be a blue moon over London. While I know people will disagree with me. I'll say it now, I will not answer to questions on this view. It's just that a view and nothing more. In 1979 there was a lot of controversy and violence with the Islamic take over of Iran. Iran was not overly Islamic. Iran had much better USA relationships before 1979. Many Iranians hate the Islamic regime in their country. Many are not Muslims but pay lip service to cover their asses so they get in line and follow suite. Iran is a very dictatorial regime. The present islamic rule was forced onto the people in my eyes. Even the last election was apparently fraudulent. People protested it and the rulers were murdering their own citizens in the street. There is rumours other party leaders leading up to the elections of being arrested for a while which was devastating to the political opposition. With all the BS, I think the citizens are living under a dictatorial hell with a lunatic of a leader(s) and they just pay lip service and nothing more to saved their behinds from being burned. Therefore many Iranians are secular. What deep wisdom to be found in that reply. When you are talking about Iranians of your experience and citing polls of Iranian Americans and Iranian Swedes I think you've missed something pretty significant... If you lived under a religious dictatorship and were yourself secular, wouldn't you consider seeking asylum/emigrating? As I said, I don't find other immigrant groups, say Afghans and Somalis and Pakistanis, as secular. Many of them are quite religious. "Why are Iranians so secular?.. That's mediocrity511's point I think- that you are seeing a filtered sample and supposing it to be typical of the nation. The answer to your question may well be that secular Iranians emigrate more , so they are over represented in your sample. Also, isn't there an urban/rural cultural divide in Iran, with the city dwellers tending to be more secular than those in the rural areas? It's that way in the US also, and probably in many countries. All that means is that if you are iranian and want to be secular you are going to want to leave iran. When you read about homegrown terrorists, that is, well-integrated Muslims who, often to the surprise of their families, turned into radical Islamists, you will rarely, if ever, find that they were Iranians. Thats because Iran is shia. The most popular violent version of islam at the moment is sunni and they have views about the shia that make their views with regards to the US look practically complimentary. Its generaly best not to lump Persia into the wider islamic world. Iran does have a substantial secular population, probably the largest in the region, held captive by a terrible theocracy. But even with the theocracy ruling the land, Iran still is pretty secular. They're taught evolution with no mention of god in schools, for example. Probably because they're the ones most likely to emigrate when the religious hardliners took the place over. I consider that they don't have to be religious outside Iran as they had to be inside Iran. There's several Iranian/Muslim owned shops at the Mall where the women workers!!! have universally stopped wearing any scarf. And some of them wear pants, and makeup and other "nice to be free of religious constriction" stuff. The Shah of Iran was a secularist who admired the West and was disdainful of fundamentalists. When he was overthrown, many of those who had supported him fled. So, the average Iranian immigrant was probably less likely to be religious than those who were comfortable staying in Iran. Your question is a bit like asking why so many people with German last names in the US are Jewish. German Jews hated being in Germany more than non-Jews. "Comfortable staying" or without the means to leave. I think that's right. Also the poorer people in Iran tend to be more religious than the richer and better educated Iranians. The Iranians who are richer and better educated are more likely to be secular and more likely to have fled Iran after the revolution. As always, choose the one that offends you the least. It's like Communism. People aren't very enthusiastic about it once they're forced to live under it. "They say the right things. They ‘speak truth to power’, ‘transgress boundaries’, and all the rest of it. But you will have noticed that they are careful only to challenge religions that won’t hurt them (Christianity) and governments that won’t arrest them (democracies)." - Nick Cohen. Que? Neither offends me at all, so I don't know what you mean. Iran had much better USA relationships before 1979. What the hell does this mean? Is it supposed to be "Iran had much a much better relationship with America before 1979"? When I lived there I was in a very upscale suburb of north Tehran. To the west our neighbors were very progressive and welcoming. The woman of the house was one of two wives (IIRC) and when she was heading the household I and my family were welcome. Hussein and Hassan were my playmates and we were frequently invited over for meals and celebrations. To the east we had a very Islamic family that would have nothing to do with us. The father in the family across the street was a Col. in the police and they would have us over all the time as well. I cannot speak to the personal religiosity of any of the individuals I remember (except for the neighbors to the east), but as far as being open minded, my street in Tehranpars was full such people. I should of omitted that, meh. 1979 is when any shreds of secularism that existed in Iran political aspects went out the window. The American embassy was stormed. Something around 100 American hostages were held captive for 444 days. Islamic clergy took over. Lots of changes happened on the political level. On the citizen only a small number of people wanted this change. Hence the discrepancy the OP has noticed in his post. Why do Iranians seem secular. Yes, but this is not quite the whole story. The Tudeh Party was also part of the Revolution and that was a secular organization. It did collaborate with the Islamists and that turned out to be a terrible mistake. I don't think that the Revolution was initially so unpopular. As the Islamists took over then maybe more so. To all you telling me that the secular Iranians have the biggest incentives to emigrate. Yes, that's true, but Iranians in the West are as a whole more secular than any other MENA diaspora that I'm aware of. 40% of British Muslims want Sharia for instance (an equal number opposes it). Proportionate to the population, I think Israel has a larger one. According to good old Wikipedia, 42% of Israeli Jews self-identify as hiloni (secular), and between 15% and 37% Israeli Jews self-identify as either atheists or agnostics. There are in fact serious tensions in Israel between religious and secular Jews, though I guess that they to some extent are brought together by their common enemies. Is that really true? It would be very remarkable. After all gays are hanged, adulterers are stoned. But perhaps Shia Islamic exegesis is less literalistic? Yes, of course. Israel slipped my mind. See this post in your thread about Islam and evolution. As you, I was a bit surprised by it at first, but thinking about it it makes sense. One thing we do know about Iran is that, for better or worse, they're rather interested in science - and to become good at science it has to be accurate science. But Iranians emigrated largely for political reasons, while others in the ME emigrated largely for economic reasons. The latter group is a more typical cross-section of the population they came from. eta: it would be as if you looked at Iranian immigrants in Israel, and from that determined that 99% of Iranians are Jewish. Last edited by WildCat; 28th May 2012 at 10:48 AM. That's not completely true. Yes, al-Qaeda dismisses Shiites as infidels, but al-Qaeda is Salafist/Wahhabist. Not all Islamists are of that brand, and other militants, like Hamas, are more friendly to Shiites. If I'm not mistaken the Muslim Brotherhood in general (of which Hamas is the Palestinian branch) doesn't denounce Shiites as infidels. Hezbollah is a Shiite Islamist group. Very, very interesting. I assumed that Iranian science was mostly for nukes and other technology without any deeper appreciation of the values of science - we are speaking of a theocracy after all. I know that Iran/Persia has a long history of scientific endeavors, but it blows my mind how this is possible in the current Iranian theocracy. It is, actually. Shia are big on ta'wil, the esoteric interpretation of the Qur'an, seeking to interpret the batin (or inner meaning) of verses, as opposed to just the zahir, or outwardly apparent meaning. There must be some interest in the sciences. One of the AAVSO directors was recently interviewed by an Iranian astronomy magazine, about variable stars. So Shiites are a bit like Sufis? I'm not sure of this, but I read that as Shia Islam became the Islam of the Persians they incorporated Zoroastrian traits. If this is true, perhaps it had some effect. It wouldn't surprise me. While still despisable, the Iranian regime appears a bit less harsh than the Saudi regime. It is ungraspable to me how they would combine their science with belief in djinns and the host of other unscientific ideas endorsed in the Islamic holy writs. But that would still mean that there was a significant secular population that could emigrate. A population that is almost absent in the rest of MENA with the exception of Israel and possibly Turkey. The Sufis take things a bit further towards the mystical interpretation end (in some cases, a lot further), but Shia esotericism has long been a source of contention between Shia and Sunni. Especially the more puritanical Salafi brand of Sunnism. Khomeini's brand of fundamentalist Islam is even kind of harsh and out there by most Shia standards, because it draws more from Sunni fundamentalism than from classical Shi'ism. Vali Nasr wrote in The Shia Revival that "Shia fundamentalism appealed to Shia identity but did not draw on Shia spirituality. Its legal-mindedness and strict observance were and are, in fact, very 'un-Shia'"
I highly recommend his book for a good description of the differences between Sunni and Shia, and how that divide is both manifested in sectarian violence today, and how the most influential Shia group, the theocrats of Iran that are following in Khomeni's theological footsteps, is attempting to remold Shi'ism in their image. Last edited by A'isha; 28th May 2012 at 01:13 PM. I would think this opinion is pretty accurate. Although my knowledge is fairly limited on the regimes. Iran at least has elections and it appears that charges like witchcraft and cruel punishments are less favourable and lighter. There are still other religious groups in Iran, so some tolerance. Saudi has virtually no religious tolerance. Punishment for crimes like witchcraft is still rampant in Saudi Arabia. If you were to visit, you have to have a work visa and stay on the non-muslim compounds and cannot venture off into the cities. Don't take everything I said as true. my knowledge is far to limited to guarantee complete accuracy, and is opinion only. My Iranian contacts are political emigres, and not Muslim. I've noticed much the same thing. I seldom meet religious Iranians, but even most of the religious Iranians I've met still hate the Islamist regime and disagree with the mandatory head-scarf policy for women. Still, the answer to your question is simple and has already been answered so I won't belabor the point. However, another factor that may play a minor role is that Iran was at its cultural and political apex at a time when they were not Muslim; many Persians(while many Iranians are not Persian, Persians are the core ethnic group in Iran and so Persian culture is predominant in Iran) are vaguely aware of this, and if you mix it with Persian resentment toward the Arabs, many of them see Islam as an inferior "Arab" religion, unworthy of the more cultured "Aryans" of Iran. Many Persians hate it when westerners think they are Arabs, they are in fact very different people. Certain Iranian atheists I know will practically wear their anti-Islamic stance on their sleeves to demonstrate just how non-Arab they are. At the risk of going too far off topic, Iran is a very fascinating country, it's been like one big social experiment in theocratic governance since 1979. Now we see the results. We are all too familiar with how the religious right in the U.S and their counterparts in other parts of the world always claim that a lack of religiousness leads to social decay. We need more religion, they say, we need more religion in the government and the schools, and everything would be so much better. Yet in ultra-religious, theocratic Iran, based on my readings and personal accounts from Iranian friends, crime is a serious problem, drug abuse is an epidemic, prostitution is rampant in the cities and the government is one of the most corrupt in the entire world. The divorce rate it also going up. Iran would probably be a better place to live if the government wasn't so committed to policies that encourage their best and brightest citizens(who are very often non-religious) to leave. Some religious Christians may claim this is because the Iranians practice the "wrong" religion. They should be loving Jesus, not Mohammed. And yet again, compare secular states and counties with religious states and counties in the U.S, and there is often but not always an inverse correlation between religiousness and crime and measures of "social decay". His father/uncle brought most of the family to the US.. he was in the IAF. They own a couple of stores at the Mall now.